Summer is a 12-year old, 16.2hh, Thoroughbred mare looking for a home with a calm equine companion(s) as well as a horse experienced human family. 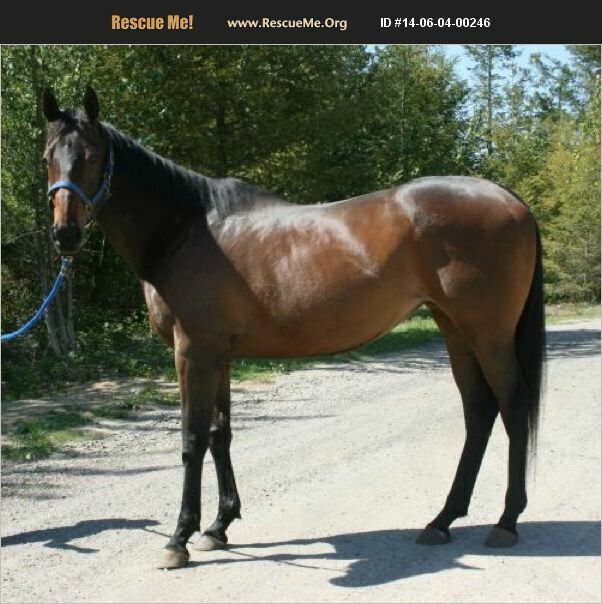 She was raced as a filly but later fell into neglectful circumstances. When Pasado's Safe Haven rescued Summer she was severely emaciated, but she has made a complete recovery and is a beautiful mare. While she has some physical challenges would make riding difficult for her, she is smart, active and still loves to have a 'job'. Summer has been a wonderful therapy horse as part of an Equine Facilitated Learning program (this is an unmounted program). She is people-oriented and has a kind, calming energy. Summer will need an owner who is experienced in caring for horses and able to manage her special needs. In 2013 she was diagnosed with EPM (Equine Protozoal Myeloencephalitis), which can cause neurologic symptoms. She improved with treatment but has not cleared the protozoa and relapses when off her medication. She has been mostly symptom free for some time but she should stay on medication long term to prevent a relapse. Summer's front legs have poor conformation and so her right front knee has slowly broken down and become more bowed over time. This has caused arthritis in her knee as well as difficulty locking her knee to sleep standing up. She wears a supportive knee brace at night to help slow the progression of the condition and aid in her ability to sleep while standing up. She also wears protective boots over her fetlocks to prevent sores from falling to her knees at times when she sleeps. Her activity level needs to be minimized because of this condition (she is not a riding horse) and she should remain on supportive joint supplements but turn out is essential for her emotional well-being. She will need one or more mellow pasture buddies where she has a place to be separated for feeding time at night. She has been pastured with horses much older than her and was very kind and respectful to them. She enjoys attention and would love to have her own person to bond with over ground work, liberty training, trick training or just snuggle time.